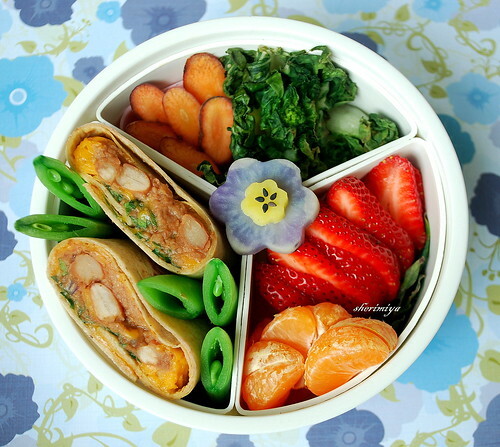 Burrito Bento, originally uploaded by sherimiya ♥. MisterMan gets a "burrito": tortilla filled with refried beans, soytaco, melted cheddar, chopped onions & tomatoes, and spring greens. We also had avocado, but I forgot to add it to this one. I folded up the tortilla, "glued" it shut with melted cheese, and cut it in half to fit in the box. He also gets sliced maroon carrots (these are dark red on the outside, but regular orange on the inside), dry roasted baby bok choy, peapod fillers, and a fruit section including sliced strawberry and mini mandarins. 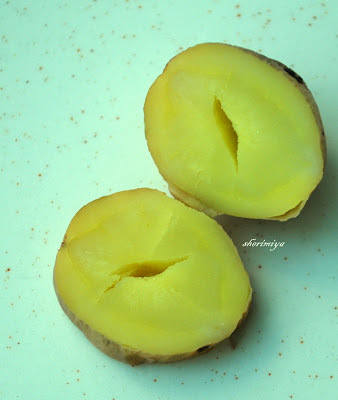 I think they are officially called Rose Finn Apple Fingerling potatoes. Somehow I thought they might be rose colored inside. But they're not. love to see all ur bento's pictures. drool drool drool - i want that burrito, please! haha i love when you use this box, it goes so well with flowers. and even though your veg is roasted (a wintry method), this lunch is still boasting bright spring colors! love! i am a big fan of those fingerlings -- they roast up pretty quick, and if you cut them in half length-wise and use them to prop up a chicken while it's roasting, they soak up all the chicken juice and come out great! I like how the background flowers match the purple potato flower! hehe, cute! I love fingerlings too; they're so durn cute, and the potato rack is a fantastic idea for chicken (and other juicy stuffs)! Thanks a lot, for the tip and the kind words! I wondered if anyone would notice...I don't really like this paper and I NEVER use it, but on this day I had to give in :) Thanks ! I love burritos and any kind of wraps in bento! They are so quick and easy to make, and they look cool in cross-section. Hope to see yours soon! All I have to say is YUUUUUUMMMMMMYYYYY. Yummers! Veggie burrito looks delish. I admire how you take extra care for providing both healthy and enjoyable meals. Sheri, your burrito looks so perfect! And the bento oohh so nice that I would like to grab it from my monitor. And it will be great if the Rose Finn Apple Fingerling potatoes are color pink hehehe ... Love the background, good choice! Oh I do love that lavender potato flower! So pretty! 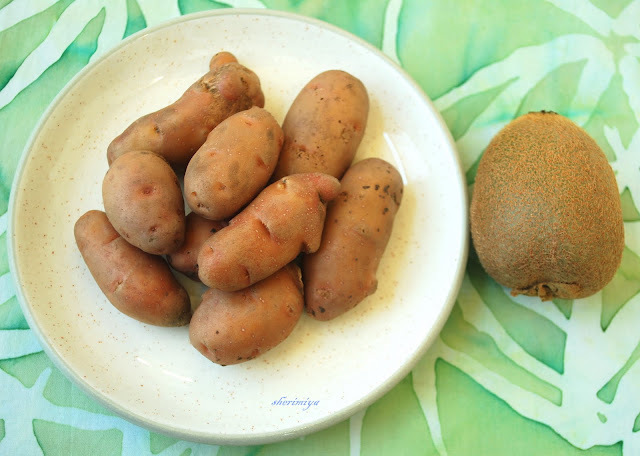 I love fingerling potatoes, makes a change from regular baby potatoes. Savory little burritos, yum, yum! This is a wonderful idea I'd love to borrow! Fresh and colorful and sweet as always, sherimiya! Yumm! I love your purple potato everytime I see it! I have not been able to find them near me :( so sad! It really adds a nice springy feel to the bento! Thanks! And thanks for the award, it is sooo nice of you! How nice of you, always so sweet with your comments, thank you! yeah, lavender potatoes; baby potatoes -- so much better than ordinary ones, right? Thanks! Hope the purple potatoes find their way to you one day! How do you dry roast the bok choy please? I washed and dried the choy, then roasted at high temp (400F) until dry and crispy for 15 minutes or so, before burning. You can do the same thing with kale leaves too; it's really good! Hope you can try it! I got the crispy bok choy idea from hapabento. Thank you so much Sherimiya, sounds great. I love greens of any kind and I'm always looking for ways to healthy cooking them. I have also just started creating bento boxes for my husband at lunch time - I'm having a lot of fun with it and I'm grateful for sites like yours where I can find inspiration. You're very welcome! I'm the same as you; I love incorporating greens into each meal, and am always looking for new and delicious ways to cook them. Hope we can share with each other!